The abuse of novel designer drugs is on the rise. Deadlier than conventional plant-based street drugs, these synthetic psychoactive substances are manufactured and trafficked in such a way as to avoid easy detection. Each year, novel designer drugs cause thousands of deaths globally. Synthetic cannabinoids and synthetic cathinones are two of the most commonly abused novel designer drugs, and their rapid proliferation calls for swift policy intervention. Possible countermeasures against these drugs include deploying new detection technologies, closing loopholes in the mail system, banning designer drugs outright, warning the public of their dangers and strengthening international cooperation. Nandhakumar, Gunasekaran, and Teck-Boon, Tan. 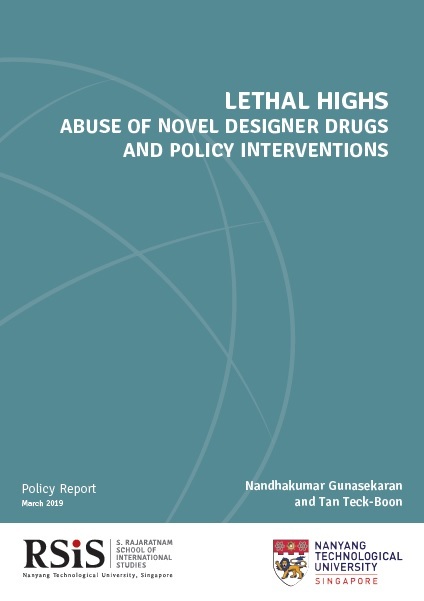 “Lethal Highs: Abuse of Novel Designer Drugs and Policy Interventions,” RSIS Policy Report (Singapore: RSIS Science and Technology Studies Programme, March 2019).